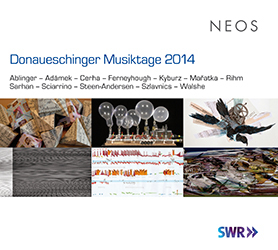 It’s NEOS who are responsible for issuing annual accounts of the goings-on at the Donaueschinger Musiktage (this year’s begins in a little over a week). The 2014 festival is represented, as usual, with a box set of four discs, though on this occasion the fourth disc is a DVD. The set features twelve large-scale compositions (many of them world premières), running to nearly seven hours of music, affording one the rare opportunity really to immerse oneself in a festival; for once, the cliché that it’s the next best thing to actually being there is entirely true. It would take a dissertation to discuss them all, but there are several that stand out more than the rest, such as Friedrich Cerha‘s Nacht for orchestra, seemingly split down the middle with its first half occupied with complex textures moving from high to low registers. The second half is sparer and more melodic, and has something of the searching freedom that typified the free atonal period; it’s really very lovely, with a later sense of poised tension released in a last-minute burst. For the first 90 seconds of Hanspeter Kyburz‘s Ibant obscuri, barely anything happens; but then, suddenly, it lurches out of the shadows, and the sheer size of his large orchestra makes itself intimidatingly felt in loud shrieks and thrusting accents (i’m not doing justice to it, it sounds literally massive). A bit like Cerha, its latter half has a melodic urge, seeking expression amidst a chaos of wonderfully unpredictable turbulence (including something akin to a wobble-board duet). The final few minutes are thrilling, ending in dazed repetitions of a single low note. There aren’t anywhere near enough recordings available of Chiyoko Szlavnics‘ music, so it’s fantastic that her three-part Inner Voices is included. 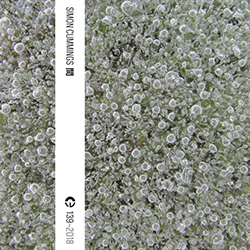 As one would expect, it’s at once beautifully hypnotic yet restless, pitches continually sliding into new formations and agglomerations, with juddering bass registers that somehow both consolidate and threaten to topple everything above. The second movement is more intense and constant, with longer pitch sustains, and as the work progresses there’s a gorgeous, strikingly vivid darkness running through the textures. Perhaps the most exhilarating piece in the set is Peter Ablinger‘s points & views, weaving together a diverse collection of found spoken sounds and sources into a kind of messed-up, way more interesting incarnation of the speech-into-music idea of Steve Reich. Its purpose seems to be in part to amuse and confuse (or maybe the former emerges from the latter), deliberately undermining the instructional/didactic nature of the spoken texts, but it’s nonetheless totally engrossing—when is Ablinger not?—embellished with a constant filigree from two pianos in the background, the music regularly breaking off in rather tortuous sequences of rising harmonics. Not everything in this box set set speaks with the immediacy or consistency of these pieces; the curious behaviour in Salvatore Sciarrino‘s Carnaval for five voices and 10 players, essentially lyrical but utmost fragmented, is sometimes comical but equally pretty impenetrable. Brian Ferneyhough‘s 2014 ensemble piece Inconjunctions works its magic slowly, fiercely shrill early on but expanding out into more diversified but united material; yet by its midpoint everything has become very vague, and never really regains either the interest or the fire from earlier. Ondřej Adámek‘s Korper und Seele, on the DVD, brings together an elaborate air machine with choir and orchestra; it’s clearly designed to be highly entertaining—the introduction, featuring contrapuntally inflating rubber gloves indicates the kind of environment this piece inhabits—but is sufficiently gestural that it’s difficult to appreciate much below the surface. The more contemplative final quarter of the piece comes as a welcome surprise, but isn’t enough to change one’s overall perception. All the same, it’s music that makes you want to return to it to relive its imaginative blend of man and machine. For once, i found myself alienated by Jennifer Walshe, whose The Total Mountain is a 40-minute mash-up of all things World Wide Webular; the range of its modes of expression is wide even for Walshe, yet connecting these disparate dots of inspiration into a coherent whole with a consistent thread is a challenge i admit at this stage continues to confound me. But i have to say, i welcome the challenge. The most memorable work on the DVD, though, and perhaps in the entire box set, is the Piano Concerto by Simon Steen-Andersen, in which Nicolas Hodges performs alongside his projected doppelgänger, the latter of which is forced to contend with playing a destroyed grand piano. This act of destruction both introduces and permeates the work; at the start its apparent slow, graceful descent is revealed to be a slow motion plummet, while later the moment of impact, endlessly repeated, becomes the downbeat in a ludicrous dance-like passage. The exuberance in Steen-Andersen’s output doesn’t always pay off, languishing in a kind of pretentious incomprehensibility—but not here; indeed, the piece works even without its visual component, communicating a musical narrative that’s strong, cogent and, at times, downright ridiculous. Just like the Donaueschinger Musiktage themselves. If that box set seems impressive, check this out. 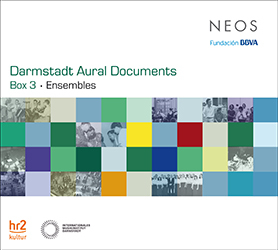 NEOS is in the process of putting out a series called Darmstadt Aural Documents, looking back through the archive of performances that have taken place at the Internationales Musikinstitut Darmstadt since the 1950s. Boxes 1 and 2 (which i’ve not yet heard) celebrated composers conducting their own music and John Cage respectively; box 3, released earlier this year, focuses on ensembles, and is a behemoth with seven discs containing 37 works, spanning performances from 1952 to 2010. Just as in the Donaueschinger box set, there’s the prevailing sense of Darmstadt as a radical musical laboratory, and as these are all live recordings, there’s often an audibly heightened expectation and excitement in the audience. The range of compositional approaches, outlooks and aesthetics on display here is considerable, from the particular kind of lyrical atonality that pervaded the 1950s (and which now sounds pretty hackneyed and tired) to the altogether more alien soundworlds heard in more recent music. Among this huge embarrassment of riches, Herbert Brün‘s String Quartet No. 3 from 1960 is one of the more telling older works. The close-mic recording lends it a powerful physicality, and there’s something highly engaging about its somewhat aloof, fleetingly agile language, Brün allowing closer engagement in a nicely muted central episode. Xenakis‘ string quartet ST/4-1,080262, heard here in its German première by Quatuor Parrenin, is outstanding, a fiery delivery that at times sounds almost synthetic, as though performed by computer-controlled automatons. This is music that dwells in the uncanny valley, provoking loud murmuring from the audience at various points, above all during the cello’s slow pizzicato descent into a seemingly impossibly deep register. The Arditti Quartet’s 1990 rendition of Richard Barrett‘s I Open and Close is an engrossing performance that reinforces just how new Barrett’s early music sounded in the 1990s, communicating a decidedly individual approach to musical drama. Another Arditti performance (joined by double bassist Fernando Grillo), the 1984 String Quintet of Johannes Fritsch sounds almost like some kind of ethnological document, its restless ritualism as if from an alien culture. The piece goes way beyond sounding like a conventional string group, breaking down into a network of unpitched sounds shared by the players. Hans-Klaus Jungheinrich‘s ensemble work Zeitspiel is sufficiently intriguing that it makes one want to listen again and again, in order to peer inside and fathom its workings, while Equivalences by Jean-Claude Eloy—heard in its world première directed by none other than Boulez—fluctuates wildly between angry and restrained materials, the latter of which aren’t in the least bit gentle, sounding as though they’re red raw. Charles Ives‘ 1894 setting of Psalm 24 still sounds surprisingly radical well over a century later, and Ben Johnston‘s 1963 Knocking Piece, performed with devilish gusto by the University of Illinois’ Contemporary Chamber Players, gets the audience especially riled up, provoking a stream of approving claps (and consequent shushes). Based on a rhythmic translation of harmonic relationships from another of Johnston’s works, it’s a fascinating piece that gains real power when the strings of the piano begin to be struck. Part I of Frederic Rzewski‘s Requiem is in the best sense remote and arcane; similar to my remarks about Fritsch, the works comes across as though it’s not only the words that need translating but the entire mode of expression; a piece that one imagines isn’t so much performed from a score as from a rubric. i still can’t work out whether there’s anything more to Horatiu Radulescu‘s 1977 work for 11 strings and two tapes thirteen dreams ago, than its glistening, glittering textural surface. Either way, it’s undeniably beguiling, and given a lovely performance here by Ensemble Köln. Two real highlights of this box set are Thomas Lauck‘s Denk daran, die Erde ist eine Trommel… for percussion quartet and Julián Carrillo‘s Balbuceos for sixteenth-tone piano and ensemble. Lauck is all about contemplation, employing impressive restraint that allows sound space both to contextualise themselves and be timbrally individual. It develops into a really beautiful counterpoint where pitch elements are almost entirely absent, built instead upon registral/timbral distinctions and density. Carrillo opts for a bizarre kind of lush lyricism, almost neo-romantic in inclination but deliciously coloured by the sixteenth-tone piano which, depending on your view, either enhances the opulence or keeps it from blooming. Mesmerising and sumptuous, it’s as though Carrillo was channeling the spirit of Debussy into a new kind of impressionism. Rolf Riehm‘s Hawking, for solo piano, bass drum and ensemble, brings to mind Birtwistle’s Ritual Fragment in the way its central drum soloist acts as lynchpin for a series of dramatic episodes. Ominous and brooding early on—sustained sounds over fleeting gestural shapes—it later explodes into hugely violent outbursts for the piano. There’s a similar level of drama in zereint by Wieland Hoban, in which a striking display of instrumental passion reveals an increasingly disunited front; Hoban explores fabulous individual and textural writing, the work’s convoluted counterpoint acting like an intense, heated discussion. Mark Barden‘s viscera is deceptive, exhibiting a clattery percussive sense of strain that feels like it’s leading precisely nowhere—until an utterly magical denouement, balancing on the liminal point of pitch and half-speaking. Among the most recent compositions, Eduardo Moguillansky‘s aide-mémoire is thoroughly entertaining, like a conveyor belt crammed with weird and wonderful delights (considering the title, his life passing before his eyes? ), many of which defy all description. City of Falling Angels by Liza Lim builds from next-to-nothing, the first appearances of pitches occurring about a quarter of the way through; it’s a striking moment that marks a pivotal shift, texture decreasing in density in favour of attractive overlapping pitches. Robin Hoffmann sets things up so that the IEMA Ensemble sounds as though it’s playing a game with itself in his 2009 chamber work anstatt dass, while Enno Poppe, in Speicher I, presents instruments seemingly subject to an imposed set of processes governing their behaviour and interaction; the juxtaposition of complex tutti textures and sparser melodious passages is effective, continually disorienting and refocusing one’s attention. Most outstanding of all, though, is Stefan Prins‘ electroacoustic Fremdkörper #1, for flute, electric guitar, percussion, cello and live electronics. There’s a fascinating impression of music wrangling in real-time, like an organic entity. It’s all very intense, maintaining a heightened sensibility and becoming even more dramatic when it plummets into quieter territory. It has a really amazing soundworld, within which it’s often completely impossible to pinpoint where sounds are emanating from (though without any hint of novelty), rendering the music marvellously exotic. 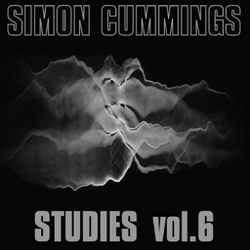 Throughout these seven discs, one gains a far deeper appreciation of the history of western avant-garde music from one particular perspective, its earlier threads, passing fads and more prevalent lines of enquiry. Darmstadt has always tended to polarise people—to some it’s Mecca; to others, quite the opposite—yet there’s no denying the eight-and-a-half hours of music presented here are a compelling, important and overwhelmingly impressive testament to what it has made possible during the last 60 years. Two remarkable box sets that i can hardly commend highly enough. Of course, they’re not exactly cheap, but the rewards (and the challenges) they offer are considerable and will keep you engaged and entertained for a very long time to come.